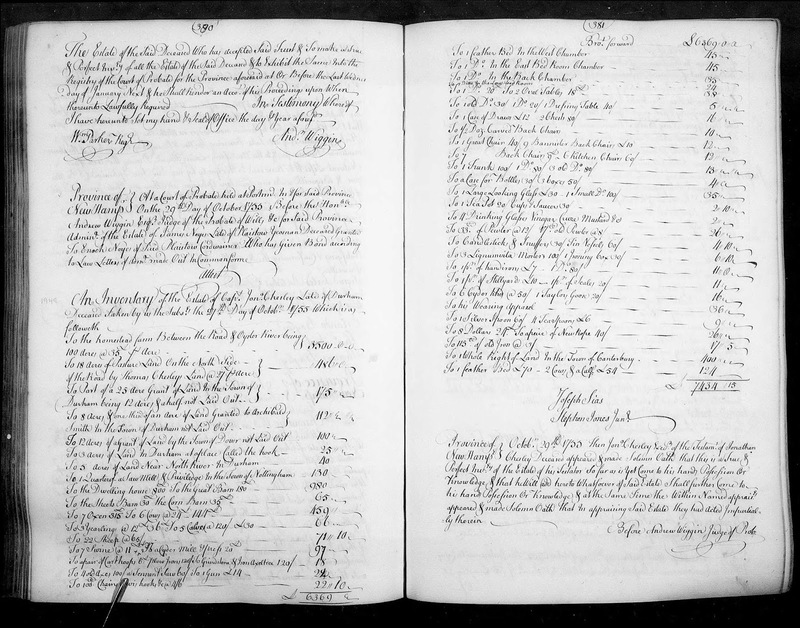 Genea-Musings: Amanuensis Monday - 1752 Will of Ezekiel Worthen (1672-1755) of Chester, N.H.
Amanuensis Monday - 1752 Will of Ezekiel Worthen (1672-1755) of Chester, N.H.
me Withal In this present Life I Give Demise & Dispose In manner following. my Estate as aforesaid & my & my Wives funeral Charges. apeice to Each of them Equal to Bills of Credit of the old Tenor. heretofore Considerable of my Estate. Current price as it then Goes at. of What Kind Name or Nature Soever as Bills Bonds Credits &c.
Was then to their Best Judgment of Sound mind & Memory. 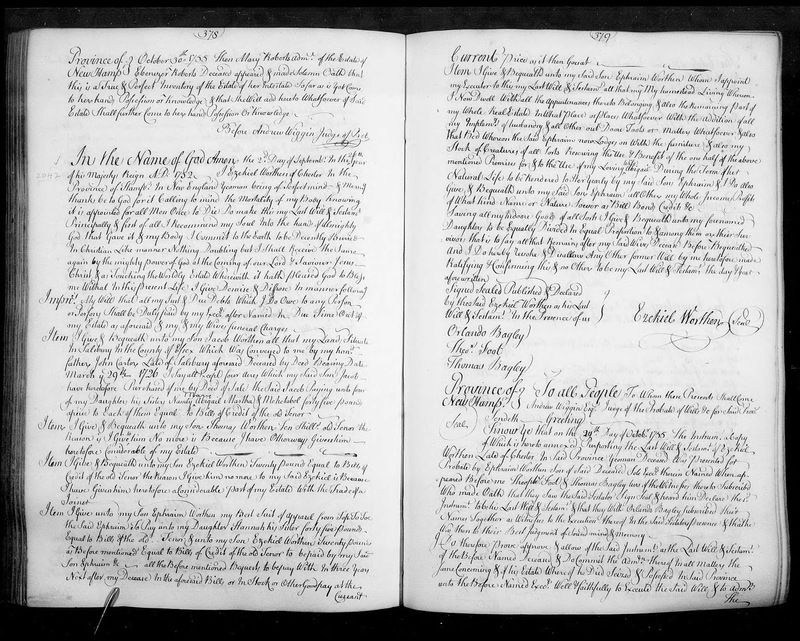 "New Hampshire, Wills and Probate Records, 1643-1982," indexed database and digital images, Ancestry.com (http://www.ancestry.com : accessed 18 November 2016), All Counties > Vol. 18-19, 1750-1756, Volume 18, pages 378 to 380 (images 542-3 of 667), Ezekiel Worthen probate records, 1755. Ezekiel Worthen, Yeoman of Chester, wrote his will on 2 September 1752 and it was proved on 19 October 1755. He mentions his wife, Abigail [Carter], who dies on 29 September 1752. He bequeaths property to his sons Jacob, Thomas, Ezekiel and Ephraim, and directs his sons Jacob and Ephraim to give 45 pounds to daughters Mary, Abigail, Martha, Mehitabel and Hannah. He named his son Ephraim Worthen to be his sole executor. Ezekiel and Abigail (Carter) Worthen are my 7th great-grandparents through their daughter Abigail (1714-????) who married Joseph Colby (1707-1768) of Amesbury, Massachusetts. Randy, I love how you faithfully transcribe a document each week. That would be a good goal for me in 2017! Thank you for your comment on my post about tracing my immigrant ancestors back to Germany. You asked if a specific document was a baptism or a marriage. It was, in fact, the baptism. But, it was a two page document and the left side - the image you saw first - listed the parents and not the child. I have now added an explanation about what is found in each column. I hope this helps! Thanks for stopping by my blog and leaving the comment.